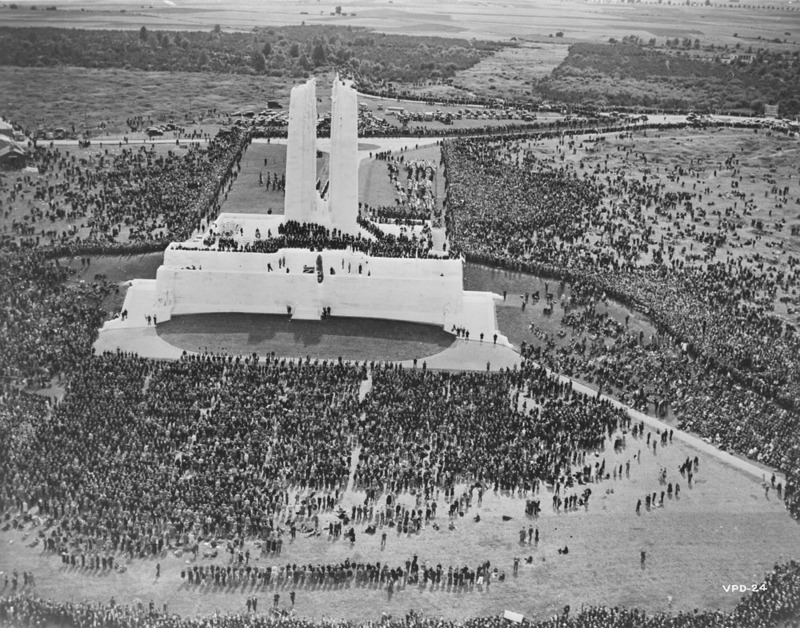 When Canadians reflect on the part we played during the First World War, the Battle of Vimy Ridge is one of the pivotal events we recall. 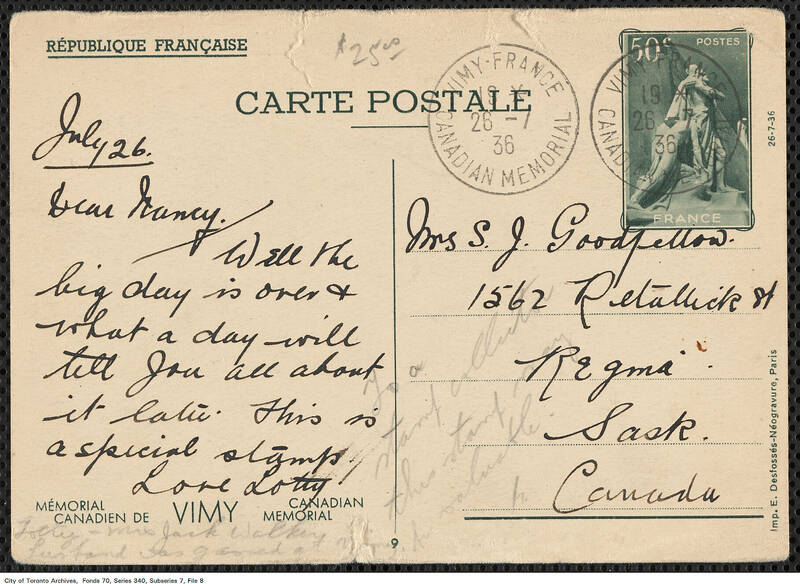 This battle, which took place on April 9 to 12, 1917, was the first time that all four divisions of the Canadian Expeditionary Force fought together. 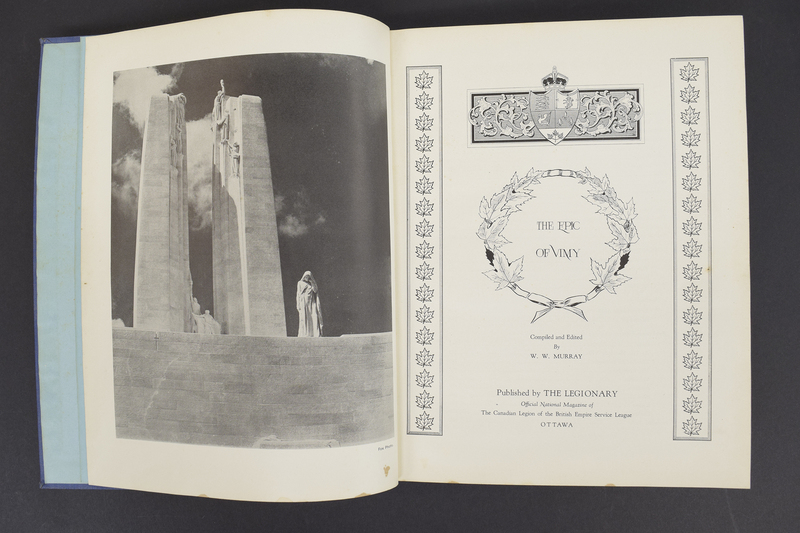 The capture of the ridge was a significant accomplishment and we remember all who fought on the 100th anniversary of the Battle of Vimy Ridge in 2017. The Canadian National Vimy Memorial serves as the place of commemoration for Canadian soldiers killed in Europe during the First World War. 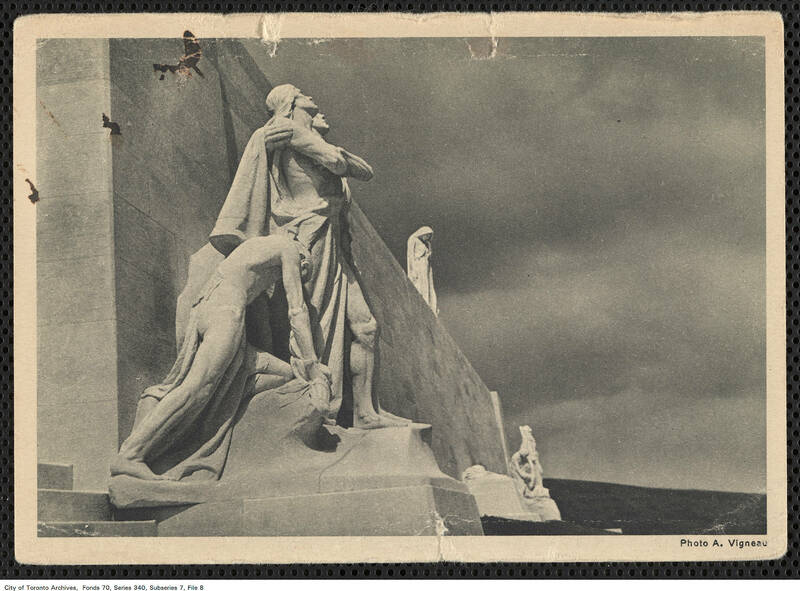 Toronto sculptor Walter Allward designed the impressive monument which was dedicated on July 26, 1936. 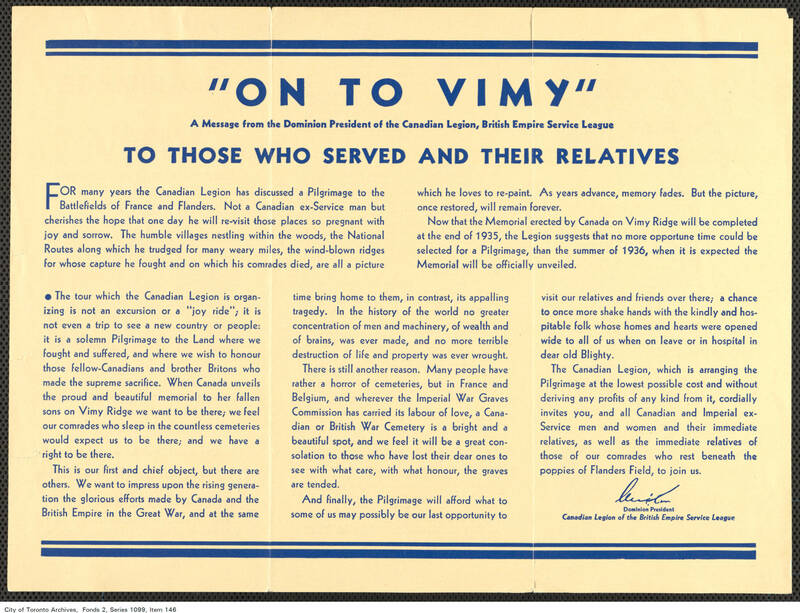 The dedication ceremony attracted over 6,200 Canadian veterans and their families who travelled to France for its unveiling as part of the Vimy pilgrimage. 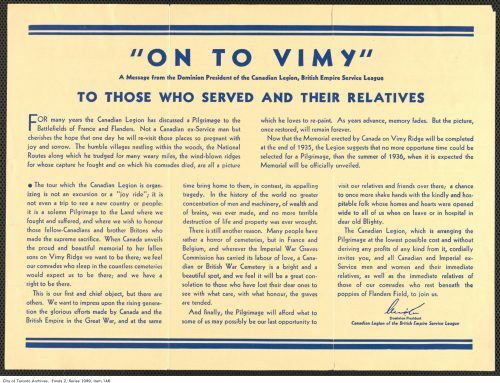 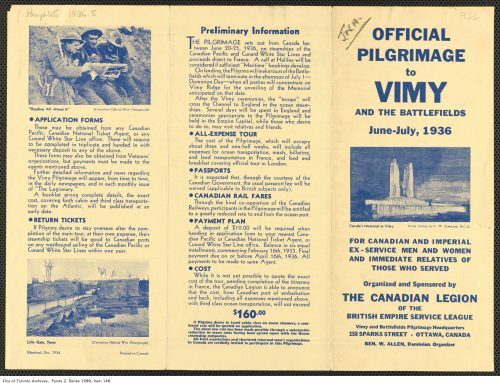 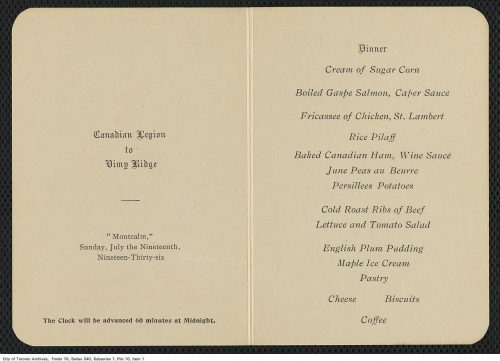 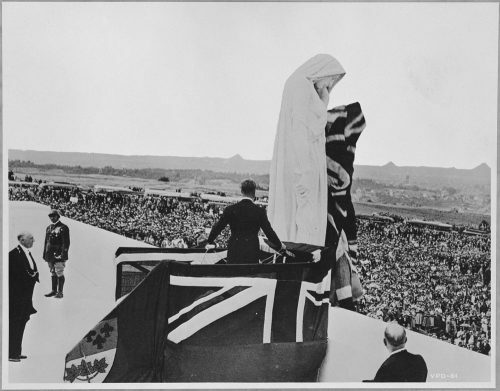 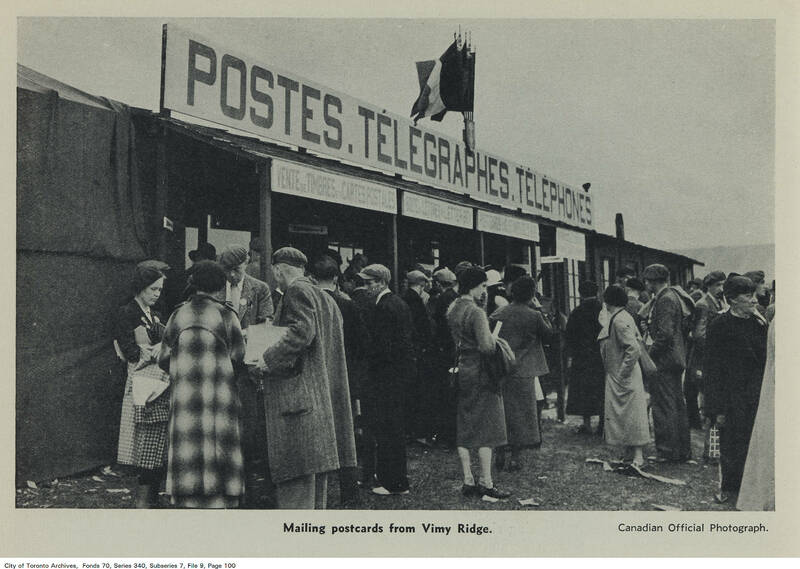 The Canadian Legion of the British Empire Service League first announced a Vimy pilgrimage for all ex-servicemen and women in their Legionary magazine in July 1934. 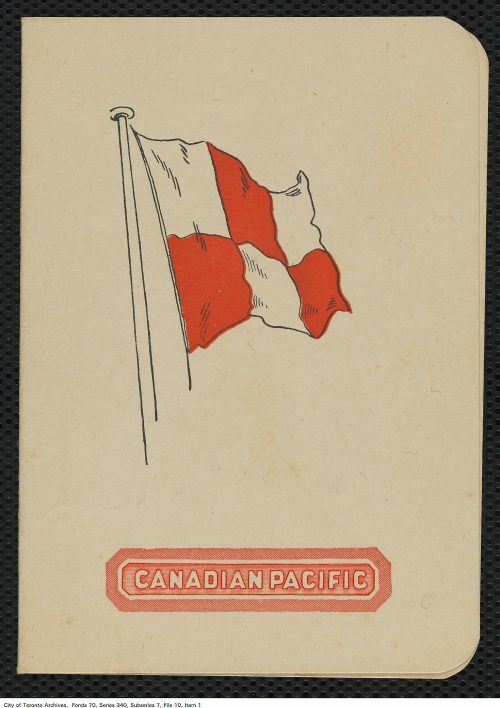 This pamphlet produced December 1934 was available to Toronto City staff in 1935 and outlines all preliminary information including cost. The City of Toronto took an interest in supporting the Vimy pilgrimage. 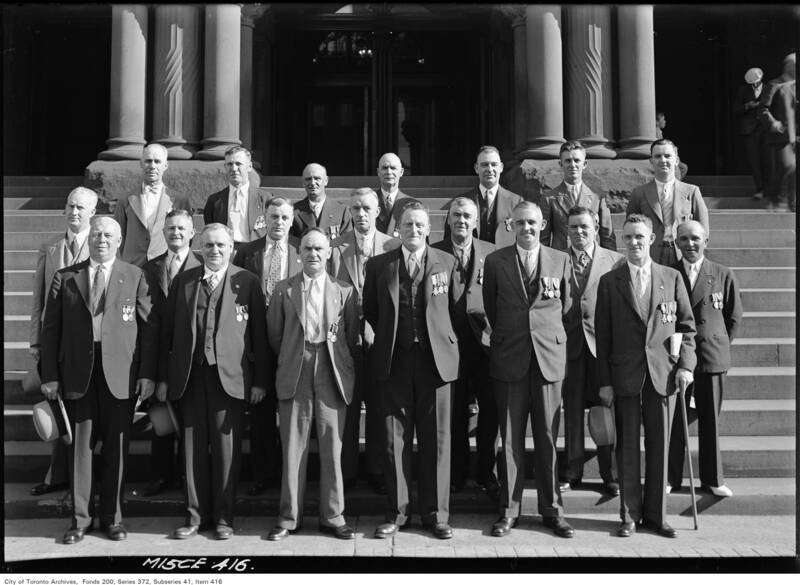 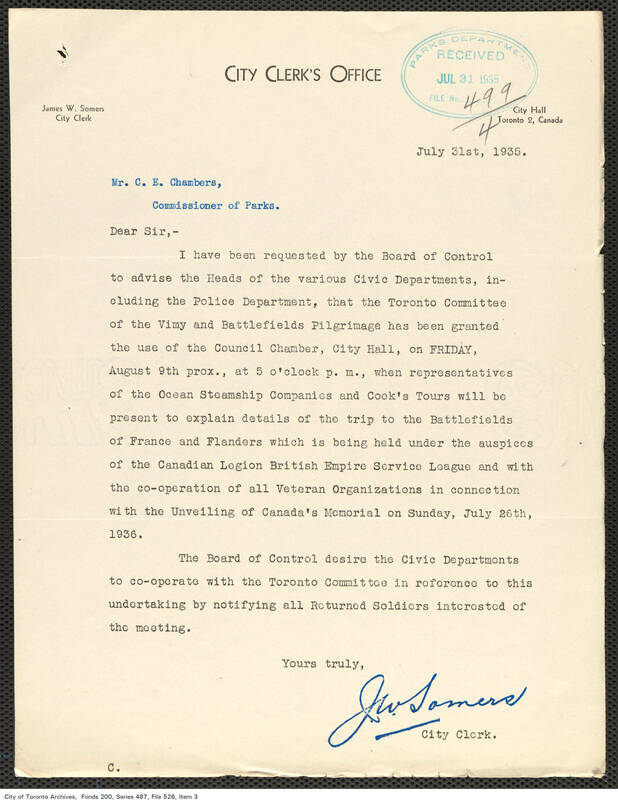 Recognizing that many Toronto civil servants were veterans, Council passed a motion on January 28, 1935 that all ex-servicemen in the City’s employ be permitted to attend the pilgrimage. 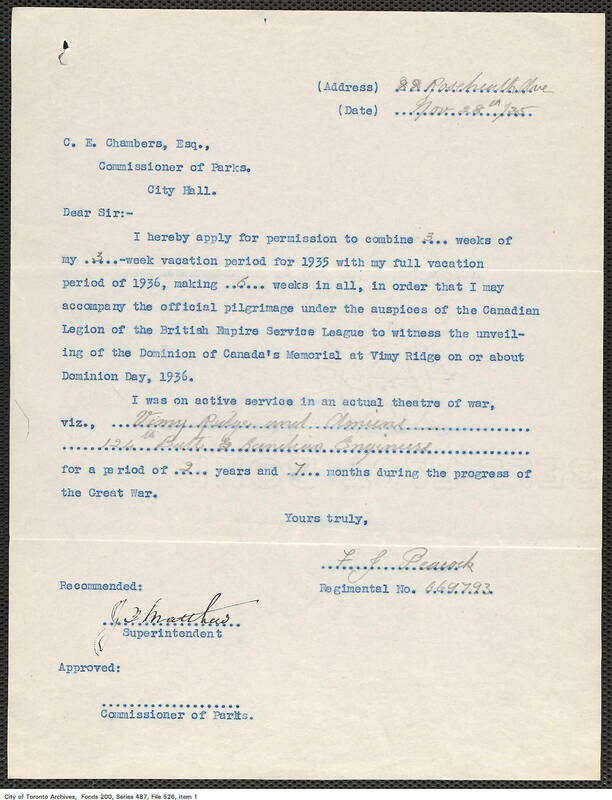 Department heads had permission to allow staff to combine their 1935 vacation with their, as yet unearned, 1936 vacation to have sufficient holiday to participate. 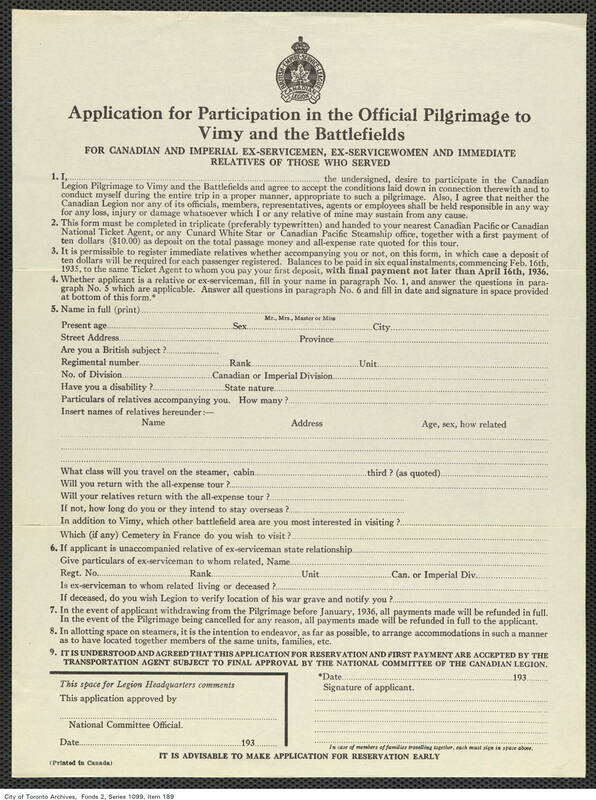 Staff members were to fill out a special vacation form just for this purpose. 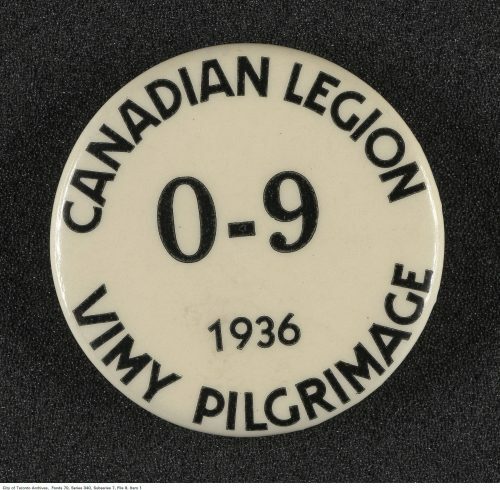 Many City staff took four to six weeks’ vacation for the three and a half week pilgrimage. 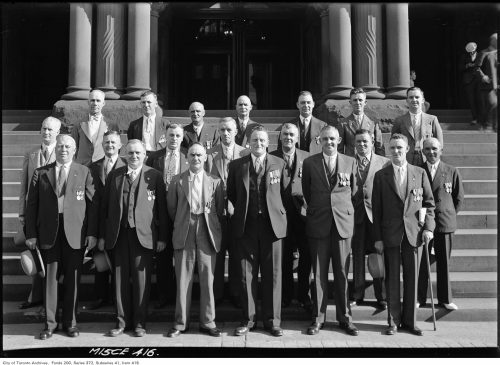 Some went after the unveiling in August or even took unpaid leave. 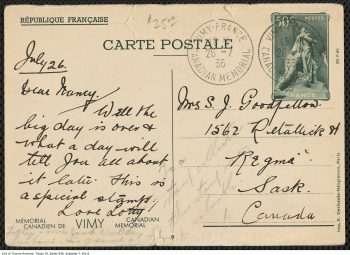 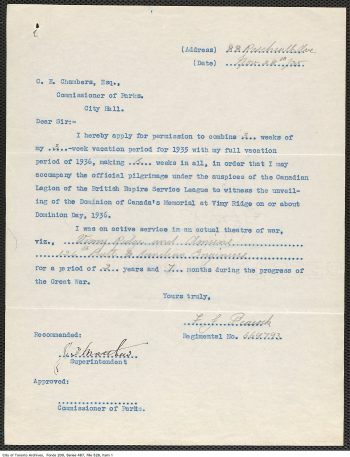 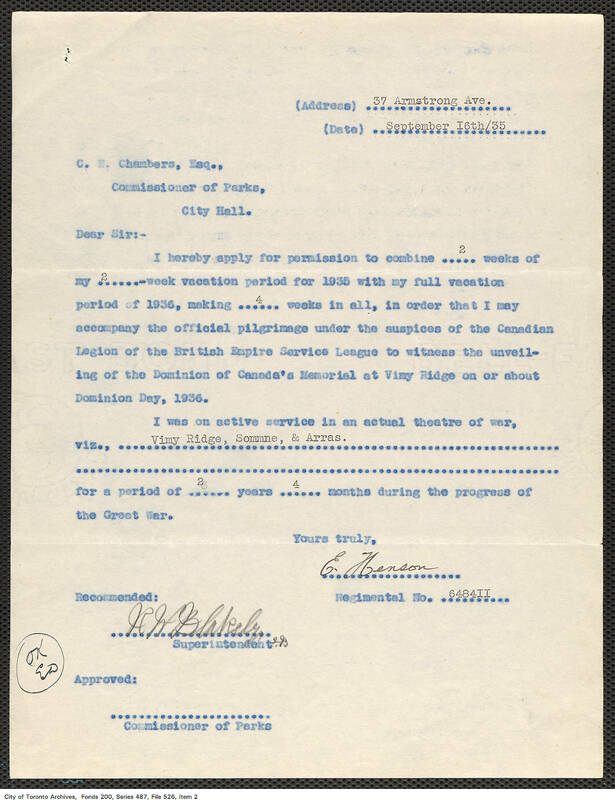 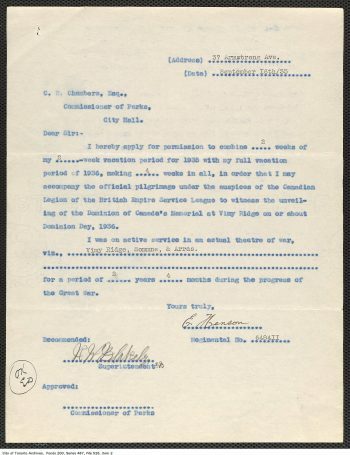 Parks Department staff vacation request for the Vimy Ridge pilgrimage. The Board of Control requested that civic departments pass on pilgrimage information to City staff. 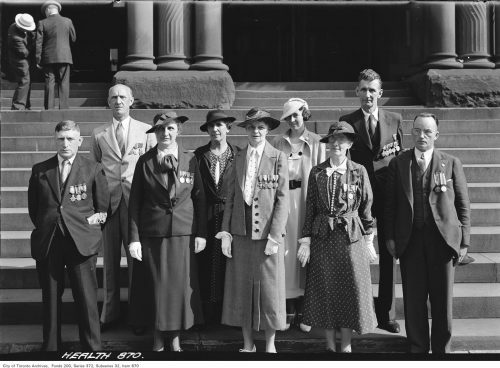 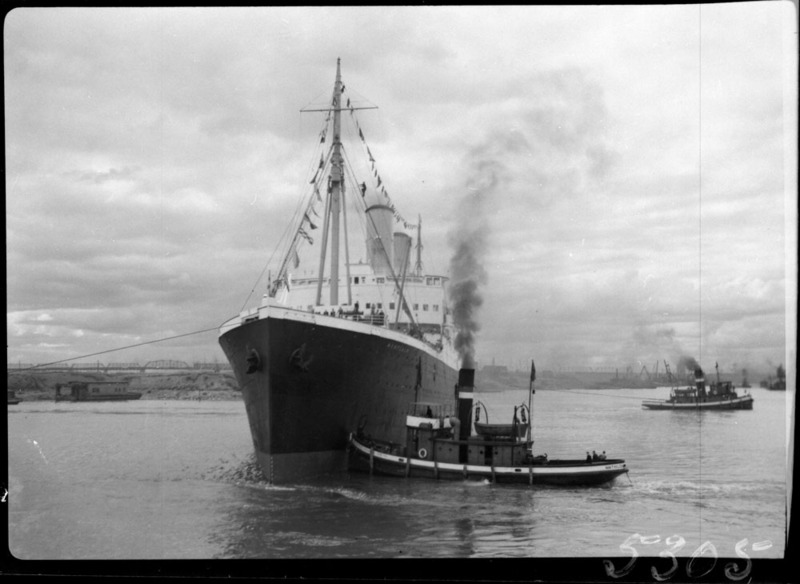 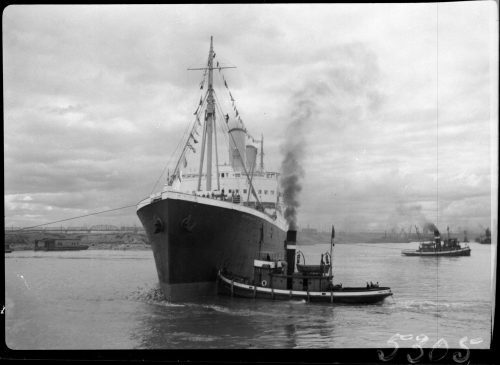 An information session was held in City Hall Council Chamber on August 9, 1935 with representatives of the Ocean Steamships Companies and Cook’s Tours in attendance. Information pamphlets and application forms were also available to City staff. Toronto City Council decided to send an official representative of the City to lay a wreath at the unveiling of the Vimy monument. 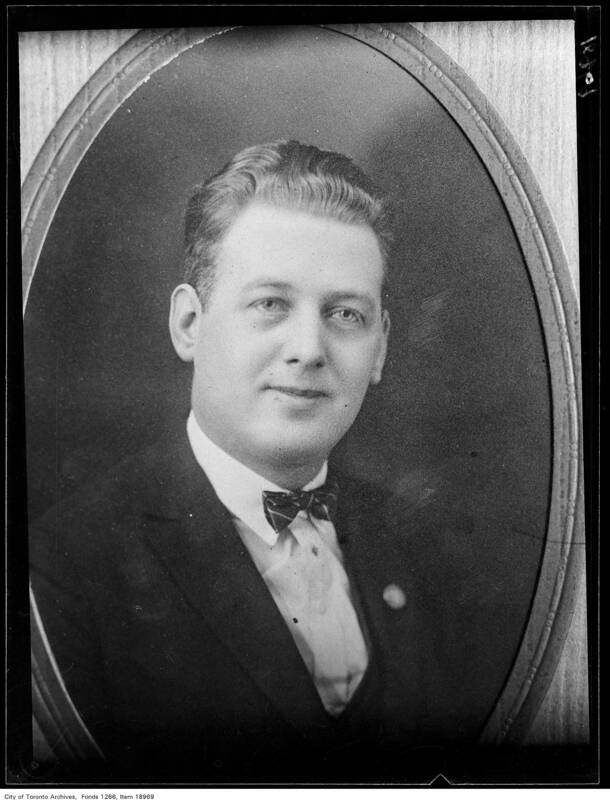 On June 10, 1936, Council authorized the expenditure of $450.00 to send Alderman Ernest Bray of Ward 8 to travel first class to France with a few days’ stay in France and in England. Bray had served in the First World War from 1916 to 1919, and had been wounded on April 28, 1917. 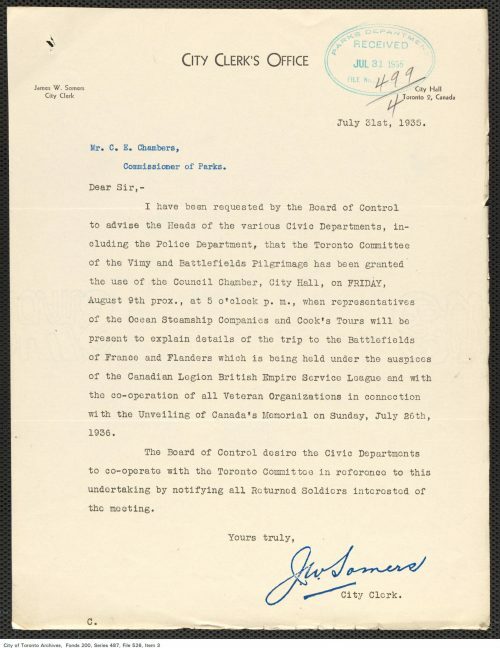 Alderman Bray’s First World War personnel records can be found on the Library and Archives Canada website. 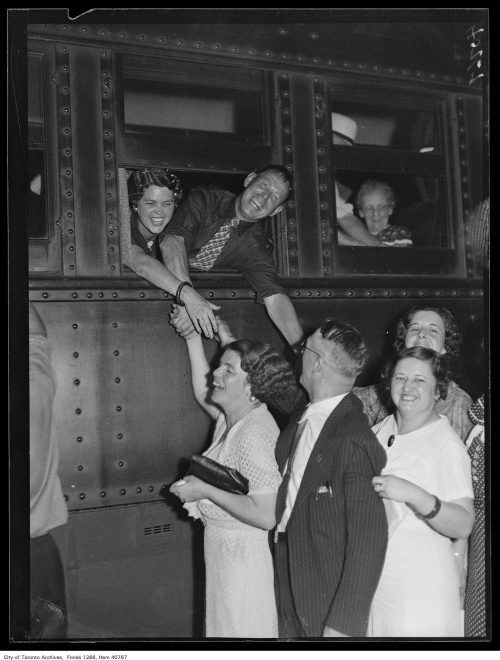 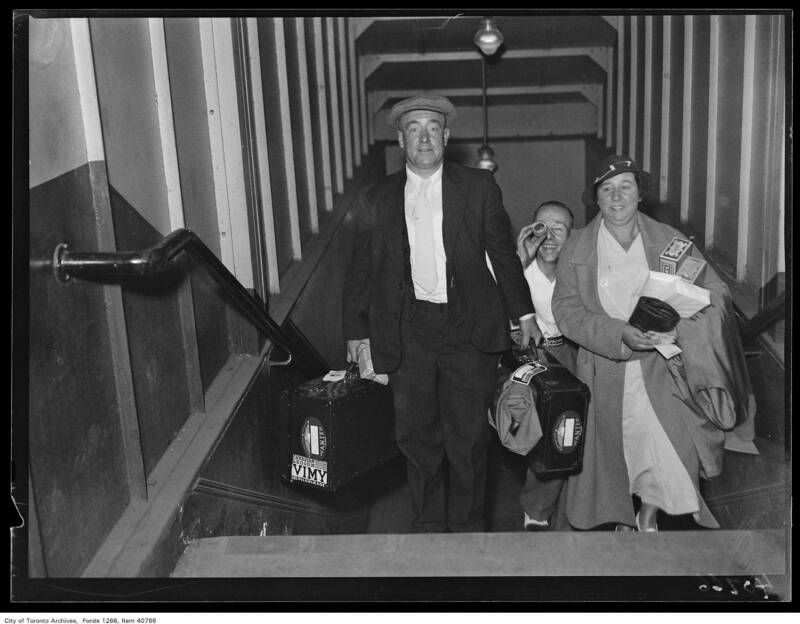 The Vimy pilgrims from Toronto began their journey on July 15, 1936 when they boarded five special trains to Montreal. Leaving Montreal by ship on July 16, the pilgrims landed in France on July 25. 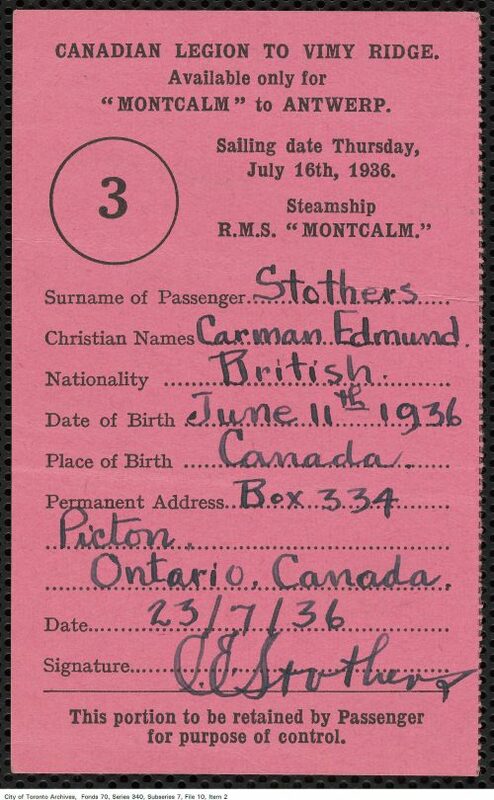 This ID button showing the ship’s letter and company number, was part of the pilgrimage kit each participant was given. 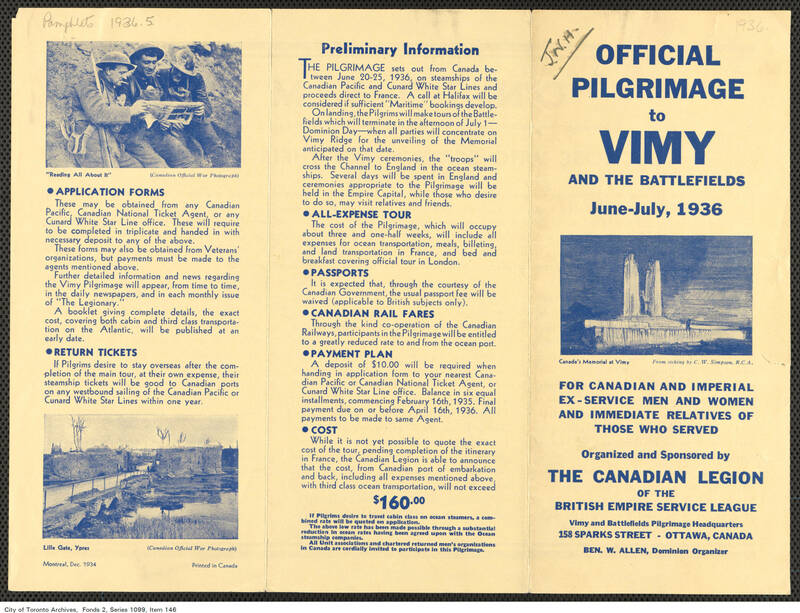 The kit also included a haversack, a beret, a Vimy pilgrimage medal and a guide book.